Which Healthcare Company Is the Best Dividend Stock? By running through a simple checklist, we can narrow the list of the 10 highest-yielding healthcare stocks down until we have a single recommendation for your portfolio. With the S&P 500 near its all-time high and interest rates still hovering near their all-time lows, it's getting harder than ever to generate safe income from your nest egg. Thankfully, it's still possible for investors to earn decent yields from individual stocks. But it's not easy to find dividend stocks worth buying. So let's take a look at the 10 highest-yielding healthcare stocks with market caps over $300 million to see if we can identify which one is the best buy now. In general, healthcare companies provide products or services that stay in fairly steady demand no matter what is going on in the economy. That's a huge plus, which is why the healthcare sector is a great place to hunt for dividend stocks. Of course, not every healthcare company is capable of producing consistent results. Competition in the industry is fierce, and it's common for sales of blockbuster drugs to plunge once they lose patent protection and generic versions enter the market. With that in mind, let's take our initial list and weed out every company that hasn't consistently grown both revenue and EPS over the last five years. That immediately eliminates a handful of companies from contention. 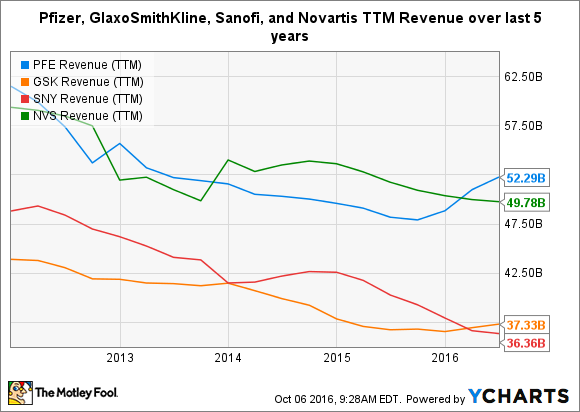 Pfizer, GlaxoSmithKline, Sanofi, and Novartis have all seen their top lines shrink over that time frame as some of their biggest sellers have been exposed to generic competition. This test also eliminates Kindred Healthcare from contention. While the company has grown its revenue at a brisk pace thanks to a series of acquisitions, its earnings history has been highly erratic. I'm a firm believer that you should only buy dividend stocks in companies that have the ability to grow their profits over time. Otherwise, it will be nearly impossible for them to raise their dividends year after year. Right away, you will notice that market watchers expect PDL BioPharma's EPS to significantly decline over the next five years. That's because its largest source of revenue is set to disappear. That makes it a stock that investors should avoid. PetMed Express, better known as 1-800-PetMeds, has a consistent history of growth and pays a solid dividend. However, I for one have a hard time getting excited about the prospects of low single-digit growth. With more promising companies on this list, I think it makes sense to skip this stock, too. The payout ratio is a great metric for judging how sustainable a company's dividend payment is. In general, the lower the payout ratio is, the better: If a company has plenty of spare cash after paying its dividend, then it should have no problem sustaining and raising that payout. While market watchers are forecasting that Meridian Bioscience will be able to grow its bottom line quickly over the next five years, the company's sky-high payout ratio is cause for concern. It doesn't leave much wiggle room if something goes awry. Meanwhile, both AbbVie and Novo Nordisk sport payout ratios that are far more reasonable, which suggests that their dividends are likely to be more sustainable. That hints that they're better choices. Which stock is the best? While I feel that both AbbVie and Novo Nordisk are great choices, I have to give the edge to Novo Nordisk. My reason is that AbbVie's revenue is heavily dependent on the success of its megablockbuster drug Humira. In fact, more than 64% of AbbVie's top line comes from sales of the drug. If Humira's growth stumbles, AbbVie could quickly find itself in a world of hurt. On the other hand, Novo Nordisk boasts a number of top-selling drugs like Victoza, NovoRapid, Levemir, and Tresiba, and that diversity lowers its risk profile. Thus I think Novo Nordisk is one of the best healthcare dividend stocks on the market today.